This is a blog by 3 sailors crossing the Pacific for the first time, together, on a 31′ South African sloop named Kijro. We’ve joined a rally to cross the Pacific, called the Pacific Puddle Jump, so we’ll have over 100 boats to connect and communicate with along the way. We’ll be starting our journey together in Trinidad in early February, and we hope to arrive in Pohnpei, Micronesia, by late summer 2010. Follow us on our travels, and we’ll blog lessons learned while cruising, share tips for destinations, and post pictures of what we find along the way. Before we left for the UK last May, I moved Kijro off the mooring and into a berth at the new, still building, marina here in Pohnpei. Work progresses on the boat. Just yesterday we installed a new KISS wind generator. It works well, so far. I’ll be off to Honolulu at the end of December, to help a friend sail his 44′ Beneteau here via Majuro in the Marshall Islands. Should be a fun trip. I’ve been doing lots of diving this year; plus lots of instruction. Possible because I retired once more from teaching. 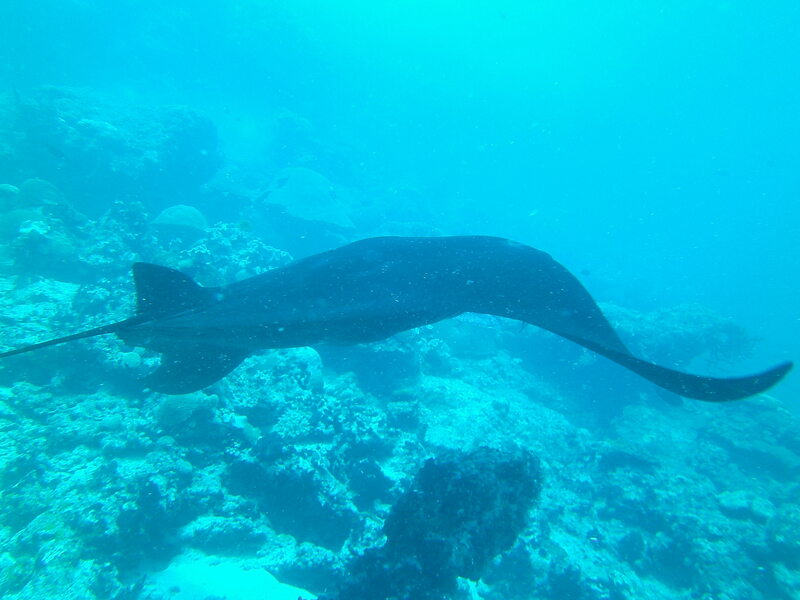 Have added a photo of a manta ray that cruised by on one of our dives recently. Visiting the cleaning station at a favorite dive site. I’ve been back three weeks and have spent most of that time ashore. Danielle is still here, and he is living on Kijro. Once he leaves in October, I’ll need to start spending days and some nights aboard. There is petty theft from yachts here, unfortunately, but if it looks like there is someone aboard, there are far fewer problems. I’m setting up some scuba class that will begin before the end of the month. Jean and I spend a weekend anchored off one of the islands inside the fringing reef. It was pleasant, and she got to be aboard for the two days. I’m hoping to start using Kijro, once the repairs get done: Aries, KISS, main sail, samson post. Still, it is wonderful to see the boat out in Sokehs Harbor. Grandson, John, son-in-law, Pidel, and Oliver, a family friend, took Danielle on a tour of southern Pohnpei, where they visited the sacred eels, the mangrove swamps, and Nan Madol, the ancient stone city. We picked up our mooring in Sokeh’s Harbor late yesterday morning after a three day sail from Kosrae. 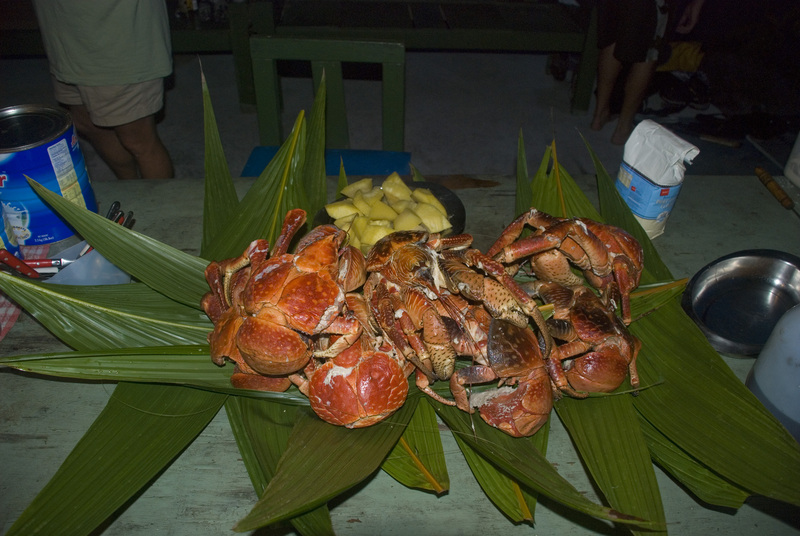 We arrived off Pohnpei about 02:o0 on 1 September. Tried to enter but thought better of it and drifted under bare poles for 5 hours before entering and going to the commerial wharf for the check in procedures. These took more than three hours, but the officals all came to the boat, making the process easy. We had a bottle of red wine in the cockpit after tying up to the mooring. Later we had a pick lunch at Ocean View Hotel, then went on a round of the bars, getting home late and feeling pretty good (not true this morning). It is great to be home. When I woke up late this morning, I saw my trombone case perched on top of the wardrobe and immediately thought that I had to secure it before it rolled or pitched off the top. It took a few moments before I realized that the apartment wasn’t rolling. I extended the stay here. Brett Cote left the boat the day we arrived, so I asked around to see if there was anyone interested in sailing to Pohnpei. Turns out that one of the managers of the Pacific Tree Lodge (Mark) wanted to do the trip but couldn’t leave until tomorrow. His son’s second birthday is today. His wife (Maria-Grazie) offered us a room for three nights if Jean could join me here. I spoke with Jean; she flew here on Wednesday (returns today), playing hooky from school in Kolonia. We’ve had a wonderful three days together, after not seeing each other since January 6. The trip from here is 320 nautical miles, which should take about three days, if we have reasonable winds and current. Forecast looks ok.
We anchored in Funafuti Atoll, part of The Kingdom of Tuvalu, just after noon today. It is a lovely place. We had a mixed crossing from Pago Pago. 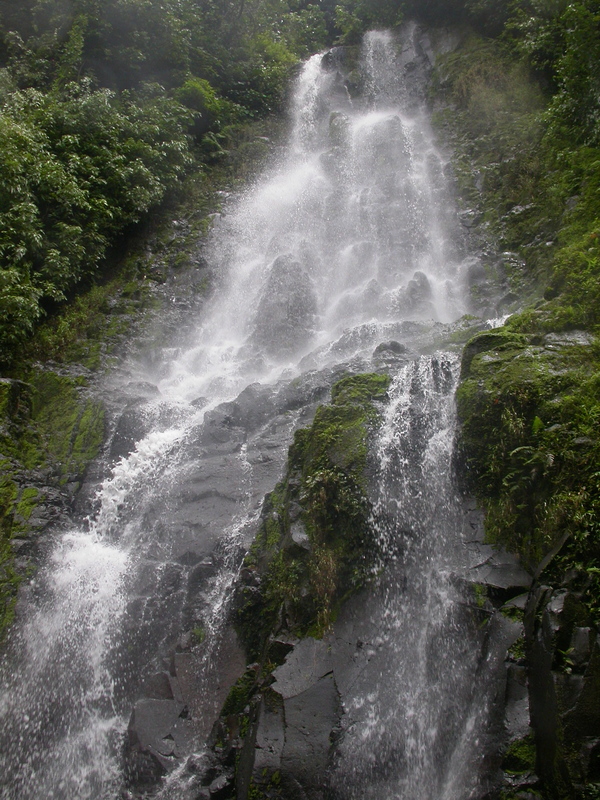 The first 24 hours was tough, starting with a becalmed period, followed by violent squalls and nearly a full day of rain. Had to sail south for awhile, to keep the boat under control, but we got here in just over six days (just about 700 miles). We will be here three nights, to try to catch up on our sleep deprivation. The boat does ROCK and ROLL. Caught a lovely wahoo about two hours out of here this morning; we’ll feast for the next few nights. From here, we’ve decided to go straight to Kosrae (about 1300 miles), by-passing the Kiribati and the Marshalls. We’re hoping to make that crossing in 10-14 days. We’ll see. No new pictures; I’m in an internet cafe that doesn’t let me use my own computer. Just a quick note to let readers know that I’ve finally added a few new photos to the web site. Hope you enjoy them. Still enjoying being here in Samoa. We’ve done some repairs, laundry, shopping, and minimal sight-seeing. More tomorrow. Plan to leave this Friday. Thanks to James and Apii! 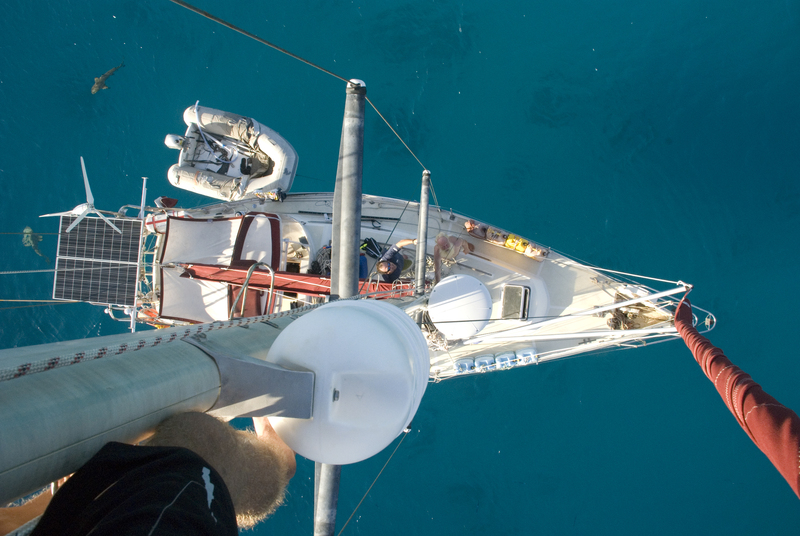 Daniele climbed the mast with his camera! We spent four great days on Suwarrow. The only other people there were two wardens for the National Park Service. The atoll is a national preserve. It was stunning, to say the least, nearly untouched since the 1960s. We went coconut-crab hunting with Apii, on of the wardens. The ensuing feast was bachannalian in scope. We toured the island, did some stunning snorkeling, swam with black-tipped sharks, and thoroughly enjoyed the time there. We then sailed on to American Samoa, which has turned out to more enjoyable than we had expected. So many of the write-ups of the place say it is dreadful. It is industrial, to be sure, at least in Pago Pago Harbor area. The canneries stink, and the bureaucracy was insane (took us four days to finally check in), but the Samoans are wonderful. They enjoy their lives, their families, their islands. Away from the harbor, the island is beautiful. We plan to leave for Funafuti in Tuvalu this Thursday or Friday. From there to Tarawa in the Kiritbati, and then onto Kosrae and Pohnpei.